The Community Eligibility Provision of the Healthy, Hunger-Free Kids Act permits some schools to provide breakfast and lunch meals at no cost to all students, a measure praised by K-12 FSDs for reducing paperwork and avoiding any stigma for students who qualify for free and reduced meals. The provision, available nationwide since the 2014-15 school year, also seems to boost meal participation. States that piloted the program for two years reported breakfast and lunch participation increases of 25 percent and 13 percent respectively, according to the Food Research and Action Center. While districts are eligible for CEP if 40 percent of students qualify for free and reduced meals, the reimbursement benefits might not be fully felt unless 100 percent of youngsters qualify for the free rate. The district will no longer be paid for students qualifying for reduced-price lunches. It’s important for a district to accurately project what percentage of participating students could qualify for the free rate reimbursement to avoid a possible revenue shortfall, says Boettger, who implemented the program last year. Boettger determined that her district would benefit if the portion of students qualifying for free meals hit 80 percent. After projecting that 88 percent of students in the district’s 22 elementary schools would qualify, she implemented the program at that level but is waiting a year for the rollout to middle schools. “Just because you qualify for [CEP] doesn’t mean that you should do it,” said Boettger. Boettger also points out that it’s important for a foodservice department to streamline food costs before joining CEP. 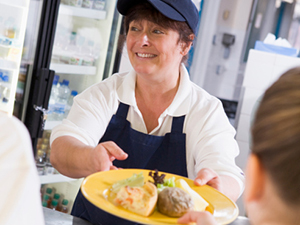 The program can prompt increased student participation, which can further strain a department’s food purchasing budget. Operators should calculate their cost per meal based upon CEP rate projections, and figure 45 percent of the amount will go toward food. Although Boettger didn’t need administrative or school board approval, she sought input from those stakeholders during the process. The information collected from free and reduced meal paperwork can also impact the amount of funding that schools receive for other programs, she says, and she didn’t want the transition to CEP to negatively impact other departments. To make a collective decision, she held workshop sessions to bring administrators and board members up to speed about the program. As a means to gather socio-economic data for funding purposes, the district opted to have parents fill out a text book application and is currently working toward getting parents on board with filling out the new form.